Extending children's books beyond their pages into family reading experiences has become very important to me. The family reading experiences create strong and vivid memories for my family about books. This post is the 170th author birthday my family has celebrated and because of these celebrations we are huge fans of 170 different authors and illustrators. 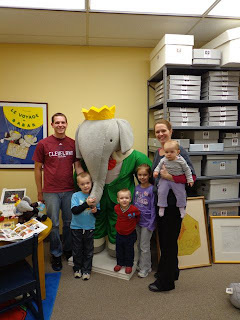 After our birthday celebration for Jean de Brunoff I told my family, "After experiencing the Babar Collection at Kent State University, I don't know how you walk away not being a huge fan of Babar!" Jean de Brunoff wrote and illustrated the first seven books about Babar, the most famous elephant in children's literature. 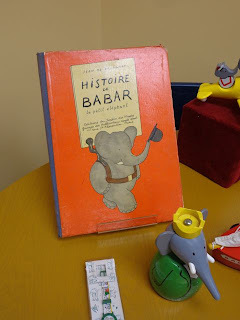 The first book, Histoire de Babar, le petit elephant, (later translated into English as The Story of Babar, the little elephant) was first published in 1931 and is still in print today. This story was first invented by his wife Cecile as a bedtime story for their two sons Mathieu and Laurent. The boys told their father, a painter, all about the tale their mother had told them. Jean gave the elephant the name Babar, developed the text, and illustrated the story with watercolor. It was Jean de Brunoff's eldest sibling, Cosette, the wife of Lucien Vogel, "a highly influential figure in French magazine journalism that made the publication of Histoire de Babar possible". (The Morgan). Four additional books and two black and white stories were published before Jean de Brunoff died of spinal tuberculosis in 1937. The final two stories were eventually published in color as books after his death. 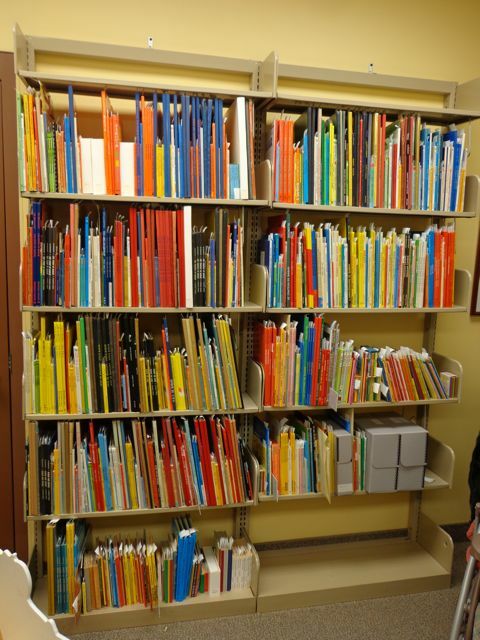 Some of the illustrations from these two books were colored by Jean's son Laurent, who has continued publishing Babar books for over 60 years! I discovered a birthday story for Jean de Brunoff that is from December 9, 1999 which would have been his 100th birthday. 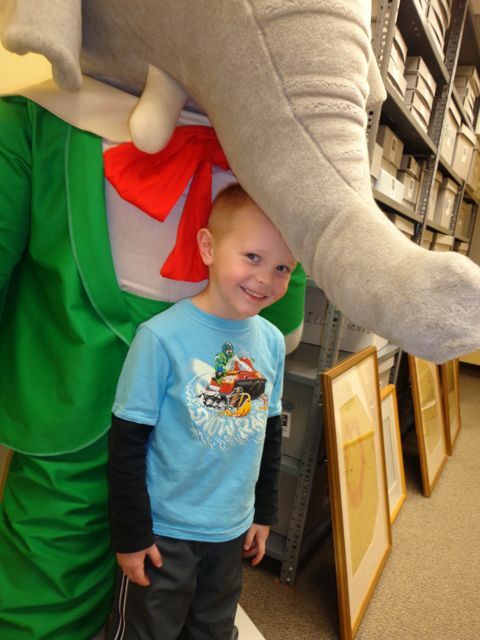 On this day, Kent State University in Kent, Ohio opened an exhibit dedicated to Jean de Brunoff's creation, Babar the elephant. (Kentwired.com). The personal collection of books and artifacts that feature the beloved elephant came to the university as a gift from John L. Boonshaft. 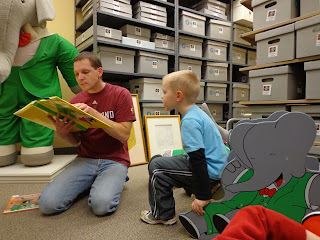 John L. Boonshaft helped Kent State University professor, Dr. Ann Meinzen with some of her research for her book, Jean and Laurent de Brunoff: the legacy of Babar. 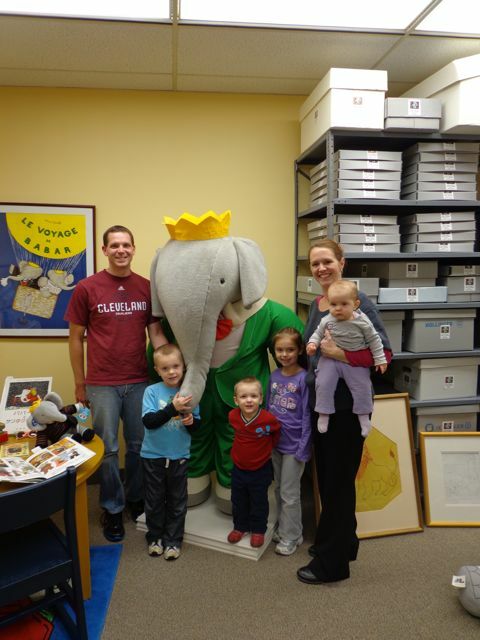 Meinzen and Boonshaft corresponded for many years about Babar which lead to the collection finding a home at Kent State University. For my family, we couldn't wait to view the collection to celebrate Jean de Brunoff's birthday. 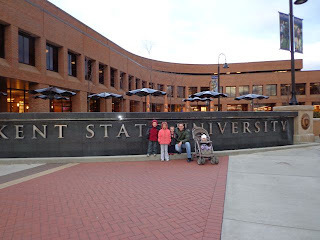 This was our second visit to the Kent State University campus. The last time was in June for Cynthia Rylant's birthday and only summer classes were in session. My kids asked many questions about college life as they observed the students -- Where is everyone walking to? Where do they live? Do they have a car? Special Collections is all the way at the top -- on the twelfth floor! 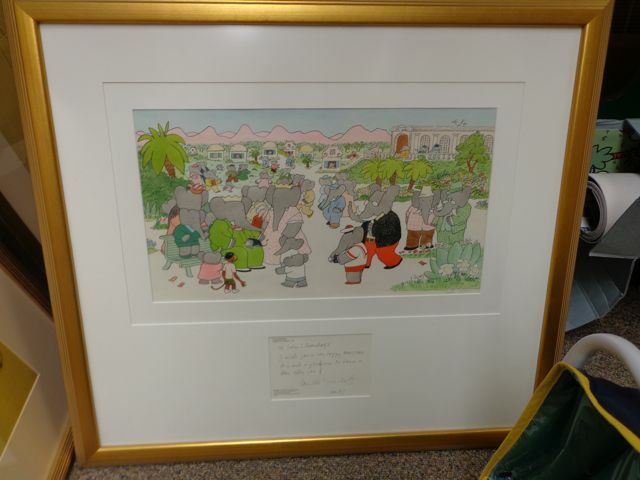 The Babar Collection of John L. Boonshaft is located in room 1213. 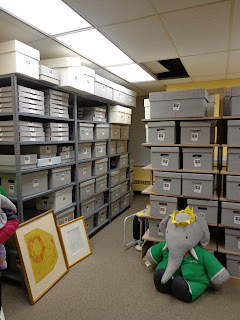 It is packed from floor to ceiling with everything Babar -- children's clothes, stuffed toys, puppets, children's bedding, etc. There are over 3,600 items in the collection. 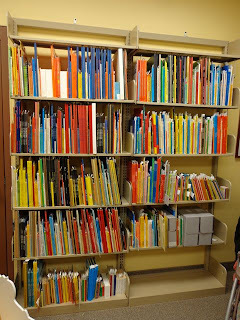 This bookshelf holds hundreds of Babar books in many different languages. A first edition The Story of Babar in French, Histoire de Babar: le petit elephant. This is one of the more valuable items in the collection. The whole collection was appraised at over $200,000 in value. 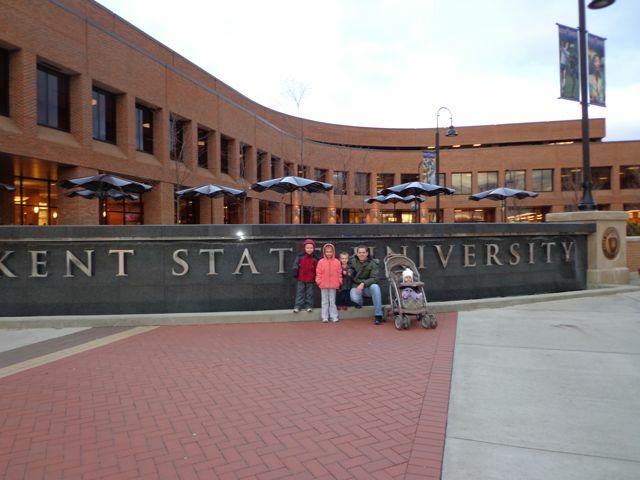 (Kent State). 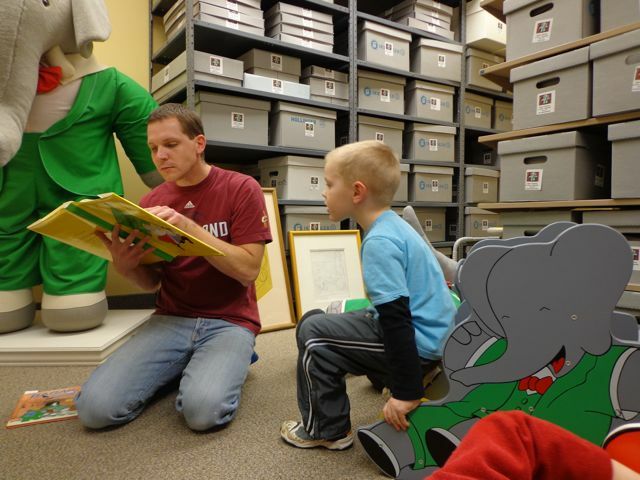 After getting comfortable in the room, we found the book Babar the King. We do not have this book in our personal collection and thought it was the perfect opportunity to read it for the first time. 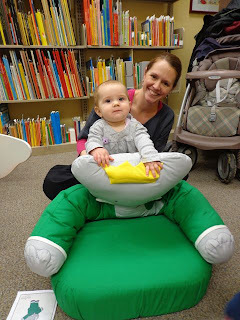 There was plenty for my youngest daughter to enjoy while we read the book. 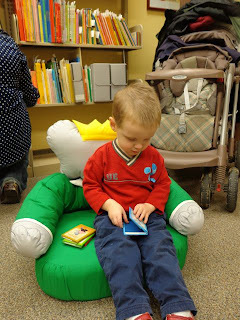 There were even cool rocking chairs for the kids to sit in while we enjoyed the book. My daughter requested to see original artwork. This piece was by Laurent de Brunoff. 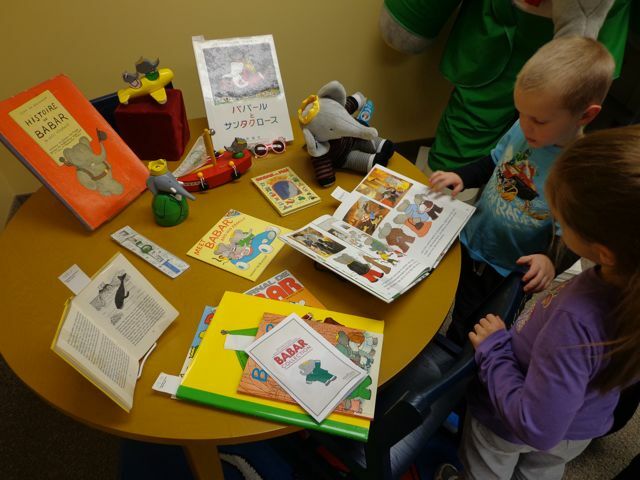 My youngest son enjoyed the mini-Babar books. I think these books were in Korean! The big Babar was irresistible to my oldest son. This was an amazing family reading experience. 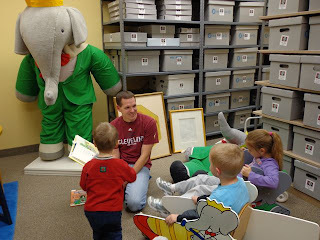 I was so happy that the Special Collections library had extended hours on this day that allowed my whole family to attend! I think we will have to make a trip back next August 30th to celebrate Laurent de Brunoff's birthday! I want to thank Amanda from Kent State Special Collections for allowing us to visit on such short notice. 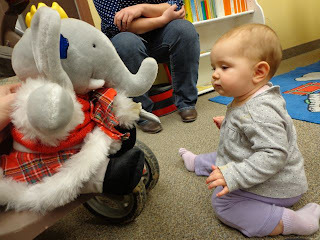 I would also like to thank Penny for her welcoming spirit, spending time with us in the Babar room, and for making copies of some of the pages from the German Babar chapter book for my daughter -- you made her day! You both provided an experience my family will never forget! Happy Birthday Jean DeBrunoff and the wonderful Babar! Love the family pictures! Great post, Eric. To know that such a collection exists is amazing! Hey December 9th is my birthday, too. I'm so excited to share a birthday with such a famous kidlit author. 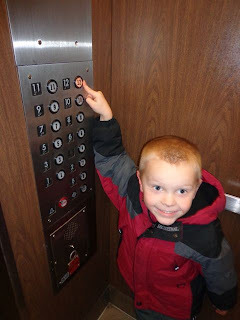 Cute post, Eric!